Windsor, Vermont’s Cedar Hill Continuing Care Community is honored to be the recipient of three awards presented by the Vermont Health Care Association at this year’s VHCA Conference & Trade Show to be held September 15, 2015 at Lake Morey Resort, Fairlee, VT. 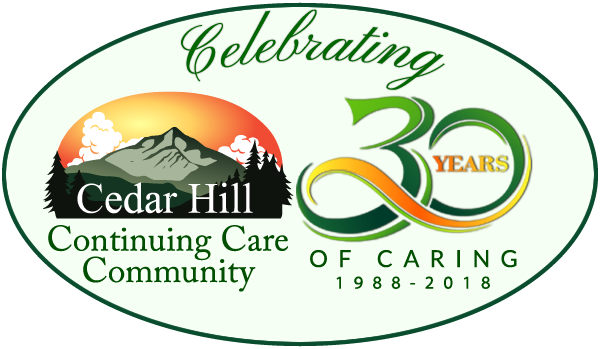 The awards banquet, which begins at 5:30pm will honor Cedar Hill with three awards: Lifetime Achievement Award, Nursing Home Activity Director of the Year, and Nursing Home Volunteer of the Year. Cedar Hill founder and co-owner Mary Louise Sayles is being presented with the Lifetime Achievement award for her tireless efforts to develop a community that would offer more than nursing home care. She and her original business partner Judy Brogren envisioned a continuum of care for older adults who wanted to live in their own homelike space but also have the availability of support services when and if they needed it. Together, they transformed a derelict one-building nursing home into a continuing care community that enables seniors to age comfortably in place and offers a range of work and career opportunities to Windsor community members. Sayles was featured on WCAX’s “Super Seniors” last winter, on her 80th birthday. After Judith Brogren retired in 2005, Patricia left a career in journalism to join her mother as a licensed nursing home administrator. Together, Mary Louise and Patricia expanded the vision further, building a $10.4 million addition to their independent and assisted living neighborhood with a secure state-of-the-art memory care center, which opened in early 2015. They dedicated the project to Mary Louise’s daughter Maria, who lost her life to cancer in 2004. The Judith Brogren Memory Care Center was dedicated to Judith, who passed away in 2013. The VHCA’s Annual Awards Banquet on Tuesday evening is a time for fun, reflection and celebration as VHCA recognizes the outstanding commitment and dedication our members have for the staff, residents and families in their communities. Earlier this year, Cedar Hill was also the recipient of the DAIL (Department of Disabilities, Aging and Independent Living) Quality Incentive Award, which recognizes outstanding nursing homes that have met high standards of quality care for their residents. The award is granted based on results of health and life safety surveys, cost effectiveness, a lack of substantiated complaints and resident satisfaction survey results. In addition to these awards, Cedar Hill has been awarded five stars on the Centers for Medicare and Medicaid Services “Nursing Home Compare” site (medicare.gov), and 5 Stars “Best Nursing Home” in Vermont by U.S. News and World Report for the second year in a row.